Since our commencement, we are immersed in presenting an elite array of Slat Chain Conveyor. Ninty Degree Magnetic Bed Slat Chain Conveyors is mainly used in left or right to connect in straight lines. Slot conveyors are used for packing plants mostly handling bags fertilizers, cement and other similar materials. Generally, the slats are of wooden or metal mounted on double strand roller type pin and bush chain is supplied moving on guides. In order to keep pace with the requirements of the clients, we are offering a quality range of Air Conveyors. The Air Conveyors we offer is widely demanded for their less maintenance and sturdiness. Offered products are made by using quality material which is sourced from reliable vendors of the industry. 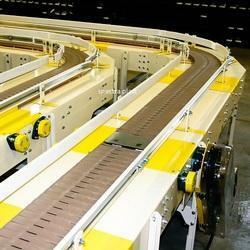 The Slat Conveyors are used for heavy duty loads like pallets and in assembly line operations of various products. The chain conveyors also come in conventional slat chain conveyors available in widths of 83 mm / 114 mm / 150 mm etc in single / multi row with SS 304 / Delrin materials. - Viswakirti design & supply slat chain conveyors which are efficient in moving the materials from one place to another place. - It is generally used in process industries and are capable of transport bulk commodities of light, medium & heavy applications like bagasse etc. Viswakirti Design & Supply Slat Chain Conveyors which are efficient in moving the materials from one place to another place. It is generally used in PROCESS INDUSTRIES and are capable of transport bulk commodities of light, Medium & Heavy applications like Bagasse etc. 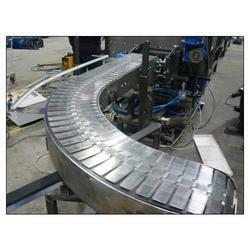 Our company has set benchmark in providing Slat Chain Conveyor.